For those of you who want to be the first on the block to own one, here are the latest and greatest products from Strongblade...well maybe not the greatest, but definitely the latest! 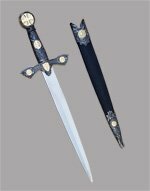 An excellent combination of fantasy and history, the SBBR-PERSIANWARSWD is modeled after the sword used by Alexander the Great in the Persian wars. 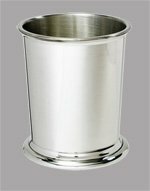 The stainless steel blade has a mirror finished and matches well with the brass guard and imitation ivory handle. This sword is a bit of a chameleon. It has a bit of Shamshir to it, a dash of kilij, and a sprinkling of tulwar. 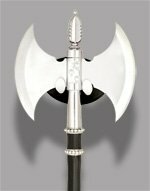 It also has a good bit of fantasy to it, similar to swords you may see in the hands of fictional characters like Drizzt Do'Urden from the Forgotten Realms books by R. A. Salvatore, or that popular Prince of Persia character from the video game of the same name. I realize that last sentence is a run-on, but for the life of me I can't decide where to break it. Please, gentle reader, edit it to your liking. Curved Swords The exact origin of curved swords is something that has been debated for years. 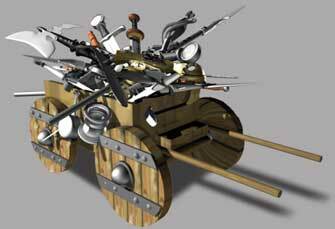 It is generally accepted that the majority of curved swords came from the East. Curved swords most likely manifested somewhere around Egypt, with the appearance of the khopesh (a weapon somewhere between sickle and sword). Since then, a number of curved swords began appearing in the East and westerners took to calling such curved swords 'Scimitars'. Technically, there is not one sword that is called a scimitar; the term refers to the entire group of curved swords that came from East (excluding the Japanese curved swords). 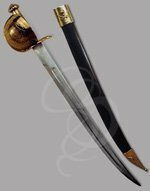 The term may be a derivative of 'Shamshir', which was a thin curved sword from Persia, although the shamshir was not really popularized until the 1500s. Other scimitars include the Turkish kilij (think of the massive cleaver swords from Aladin and you have a fairly accurate picture), and the Indian Tulwar (somewhere between a shamshir and a kilij). Some smaller curved weapons from the east include the Kopis (a knifelike curved blade that probably was the predecessor of the Khopesh), the Nepalese kukri and the hook-handled falcata of ancient Spain. Curved swords were not confined to the east, of course. As the scimitars developed in the east, the west was catching on to the trend. Sabers and cutlasses were slowly conceptualized and developed in Europe. The curved blades were ideal for charging horsemen who tended to lose their straight blades in the bodies of their haplessly impaled foes. The curved sabers could slash opponents and slide off as the horsemen rode by. Another advantage was that curved blades were more compact than straight ones, so horsemen were also able to slash from side to side without worrying about trimming the ears off their horses. Sailors also liked this compact size, since ship-board combat was often in very close quarters, with a vexing amount of wooden obstacles for swords to get embedded in. This explains the stereotypical image of the pirate holding a cutlass, reinforced recently by Johnny Depp, Orlando Bloom and Kierra Knightley in the movie Pirates of the Caribbean. Like the Pirates of the Caribbean movie, this Corsair Cutlass is a bit of a fabrication. The sweeping guard is of a design that would have been uncommon during the time of high-seas pirates. 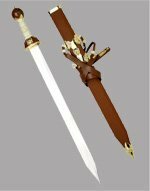 The sword is a hybrid between a fantasy sword and a historical one. Back-Swords A back sword is a sword that has only one edge. The non-sharp edge of the sword is known as the 'back' of the blade. These swords often are curved. Examples of back-swords include most cutlasses, sabers and what westerners refer to as 'Scimitars'.